Would anyone have guessed that Lo! There is yet another post about *drum roll please* the Fox Portables! 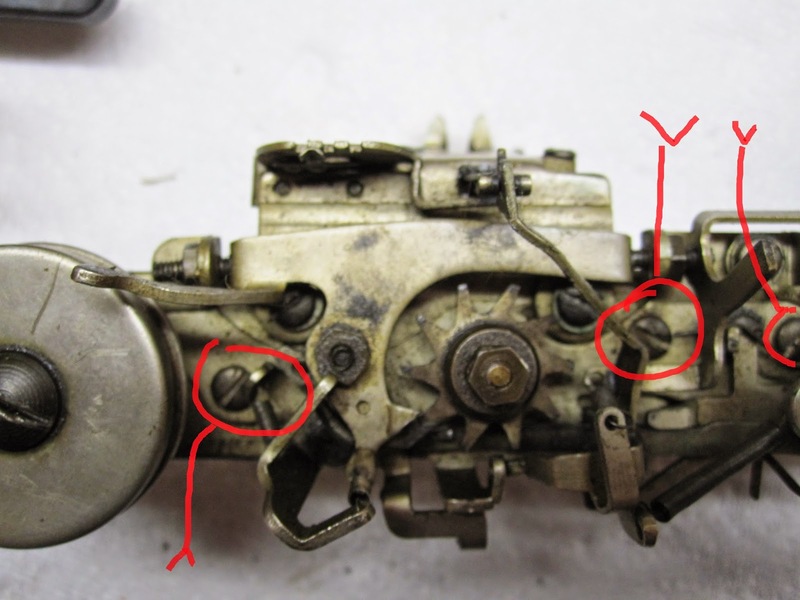 This post will detail how to take a Fox apart or, if the process is reversed, put a Fox back together. "Take a typewriter apart?" Someone has just surely gasped, "The audacity, the ignorance, the... the horror!" Well yes. 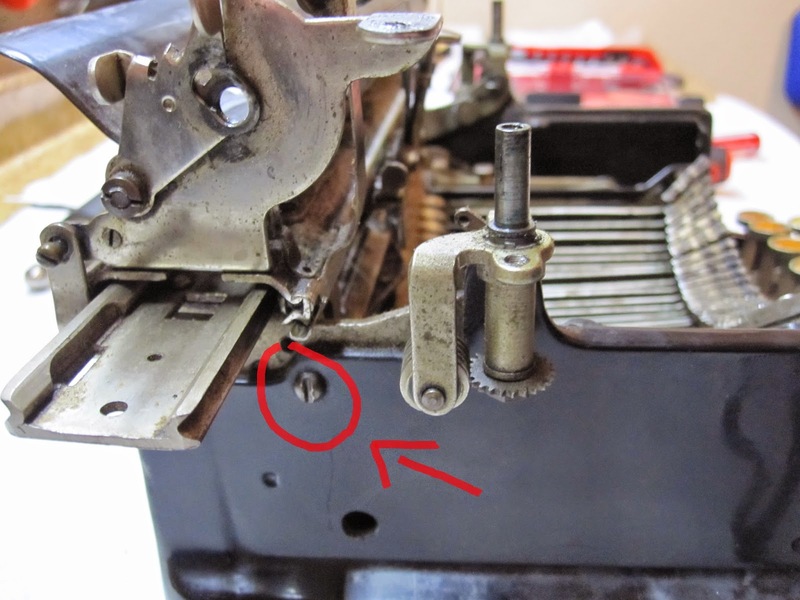 It is horrifying to take a typewriter apart when its composed of hundreds and hundreds of individual peices which must be placed back just right, else the machine will fail to function correctly. But my feelings about antiques are not quite the same as many others. I feel that something of importance and antiquity should be, indeed, displayed for others to see or, if one is so inclinded, locked up in a private collection for the pleasure of but a few. Regardless of the choice, the point is that one should care. But the other point is that I feel such things are being done an injustice by not being used. Machines in particular, as they were built with the sole function of being used. And so, despite the rarity of the machine or the complexity of the parts, I delve into each machine I come to own, mainly to clean and beautify, and also to fix any errors that a machine may now have so long since its manufacture. And thus I present, the Fox Sterling Portable Typewriter. The paint on this guy, save for its front plate (For some reason it seems Fox's just have paint issues with their front plates, no idea why that trend is so strong), is in wonderful, though tobacco caked, condition. There are other issues, as well, which will be described later, but soon enough this ol' typewriter will be able to do just that; type. The first step is taking the machine apart into its separate major pieces, of which there are a total of 3: The carraige assembly, the body assembly, and the frame. 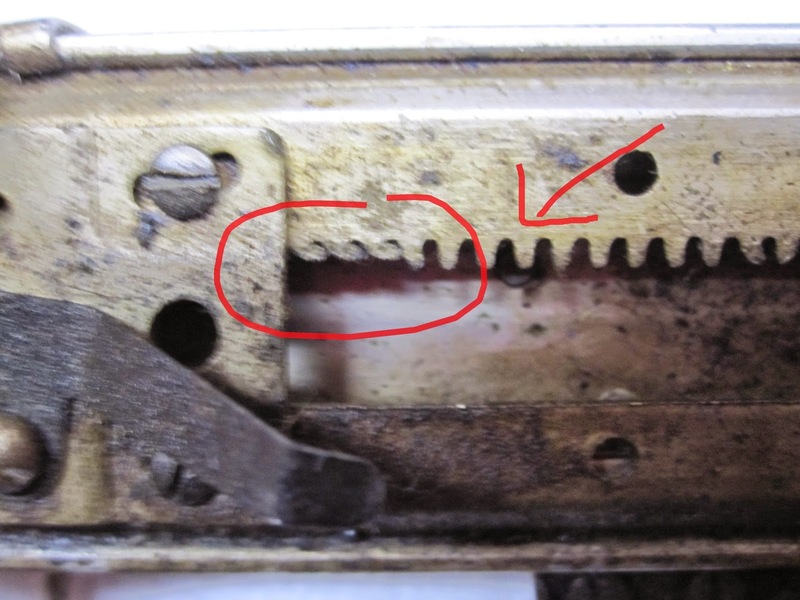 After taking the front plate off so the inside of the machine is exposed, we take the carriage assembly off by taking out the screw under the ribbon holder (1), and the one on the outside of the frame (2). Repeated for each side of the machine, the entire carriage will pop right off. 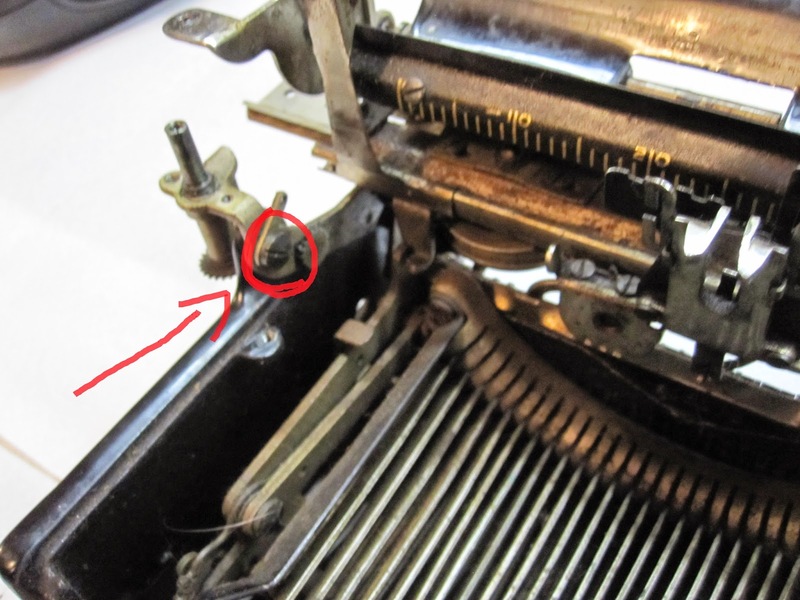 Note that the screw in (1) also holds the hooked piece in, which is usually attached via spring to its counterpart (not seen, as the spring has been taken off to the piece slumped) to operate the worm-drive. 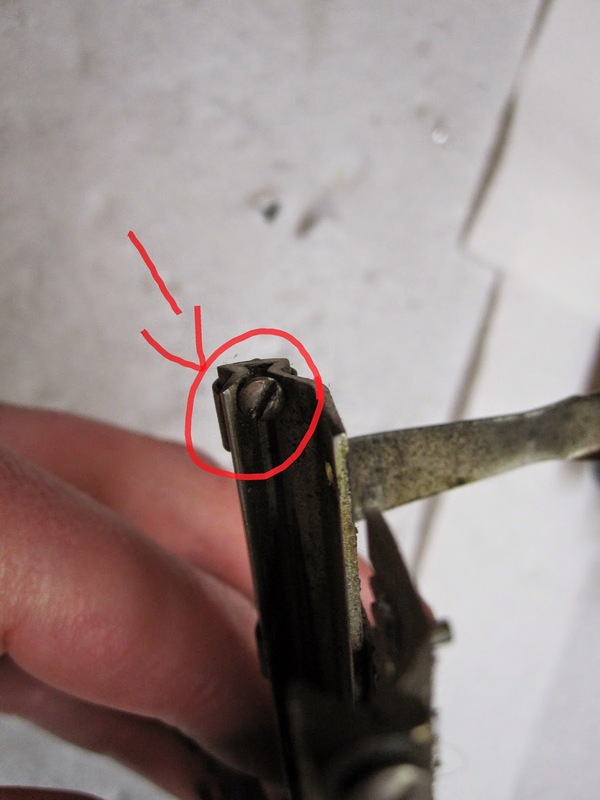 Ensure this spring is safely taken off to avoid damaging it. Your carriage should now be detached. 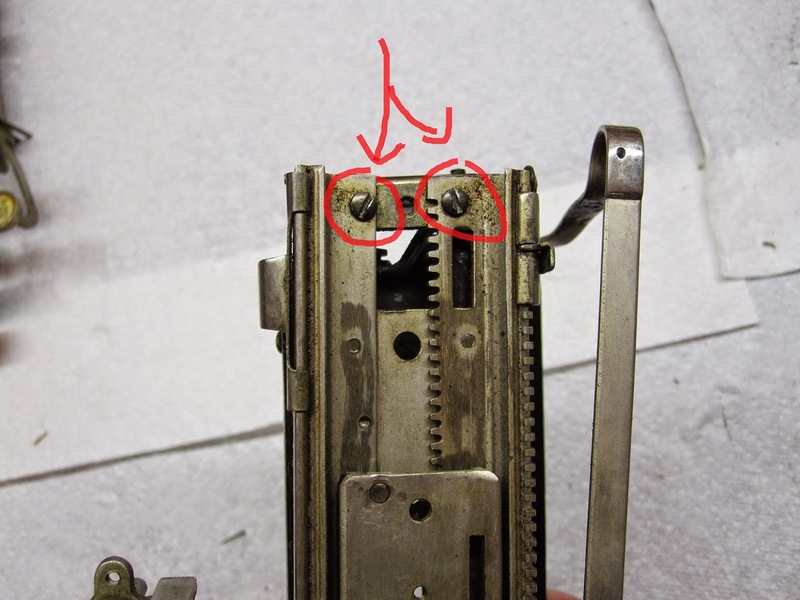 On the folding machines, those two screw areas are the same for the most part and hold the carraige to the arms rather than the frame of the machine. Once these are out on both sides of the machine, you should be able to gently wiggle the body out of the frame, or pull the frame off the body. Whichever you choose, just be gentle. You now have all three main pieces separated. The next step is of your choosing, but I prefer to tackle the carriage first. The carraige is the more complex part, and after dealing with it its nice to work on the body which is simple, and almost impossible to mess up. And so, we begin with the carriage. As mentioned above, I have already taken the platen off of this machine. Its quite simple to do, and is similar to most other machines in doing so. You should have no trouble with it. But what to do after its off, now theres the question, and there are multiple ways to go about it. I prefer to begin by now taking the sides off. Each nickel plated side is held onto the carriage by means of two screws located on the underside. And now, for me, is the first puzzle. There is a screwhole in the center (Below), between the two others which hold the side to the carriage, which is not present on No. 1's or 2's. My best guess, in looking at the carriage as well, is that these are meant to be used to lock the carriage in place during transit since the usual feature of the folding's could not work on a sterling, and is thus absent. Alas that the manual for this machine found on (http://site.xavier.edu/polt/typewriters/tw-manuals.html) does not give any indication of how one would operate the carriage lock. 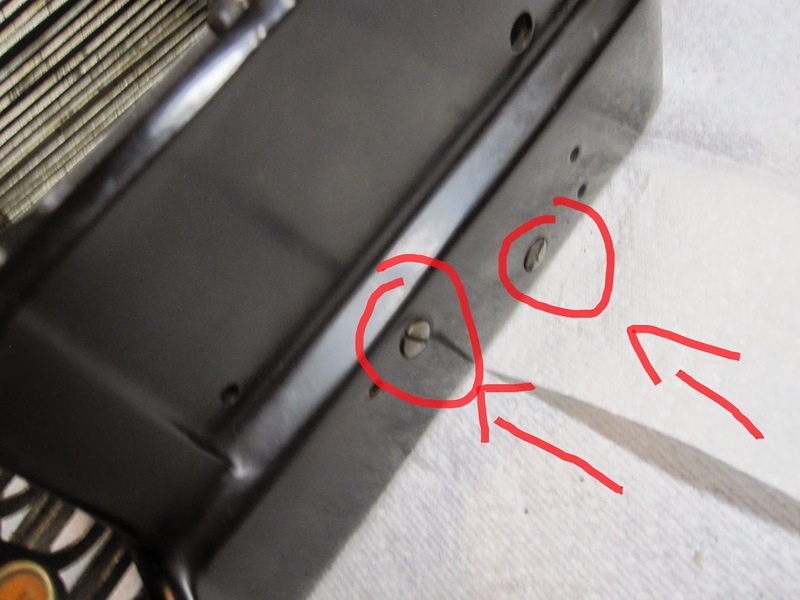 The issue with my theory is that the holes on the carriage and on the piece dont line up very well. If you beleive you have the answer to this mystery, let me know in the comments below. Next, we I find why the carriage was having issues moving correctly. For some reason, this is a commonly found type of damage on these Fox's. sighing inwardly, I continue on. The next step for me is to take the margin stops off. 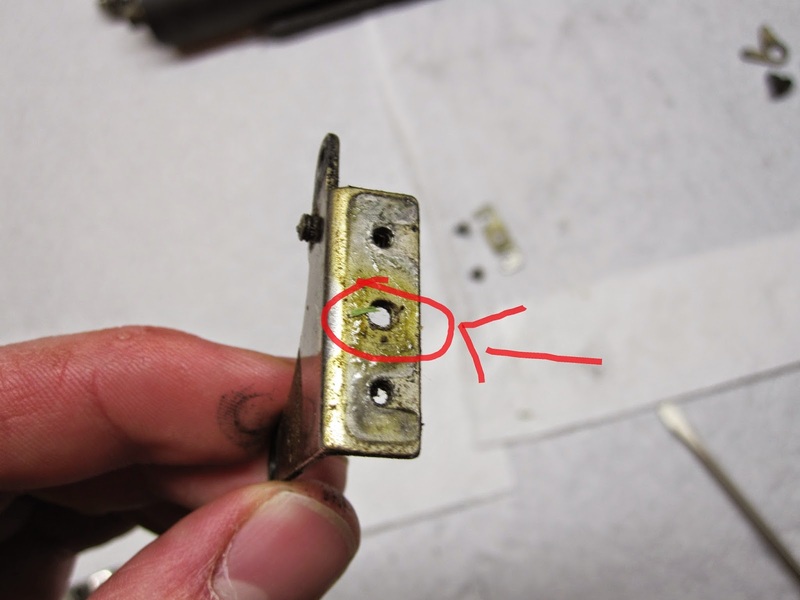 To do so requires but to now take a single screw off the carriage, and slide both off the edge. 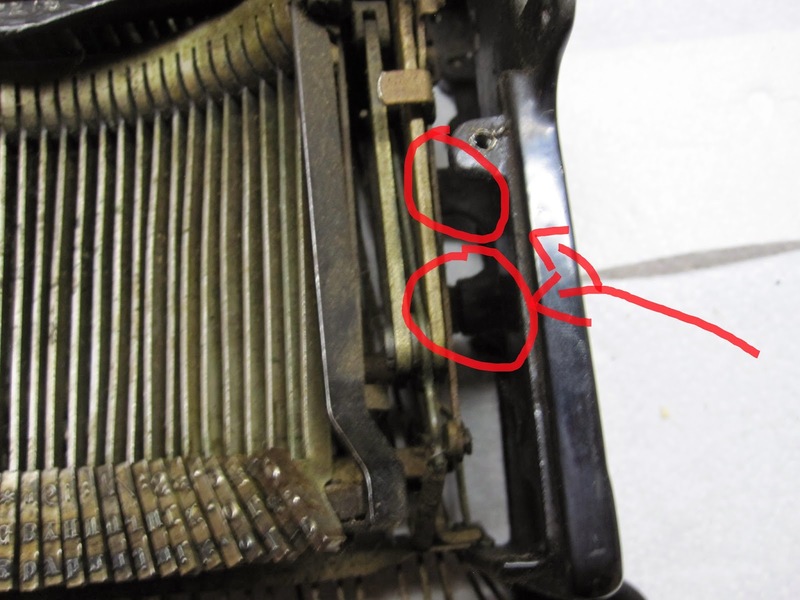 Note that, when facing the machine as if to type, the smaller tipped one (right) goes to the right, and the larger tipped one (left) goes on the left. This allows for the machine to have its margin release, so ensure they go back on correctly. Now, we proceed to taking the carraige off the rail. Three simple pieces, held in altogether by 8 screws, keep the thing together. Watch out for the ball bearings falling out as the two main carriage pieces come apart. And here below, ladies and gentlemen, is why you always lock your carriage before transport or throwing it off a cliff. The poor teeth never had a chance. Now then, tears aside, its onwards to the escapement/everything else mechanism on the bottom of the carriage. 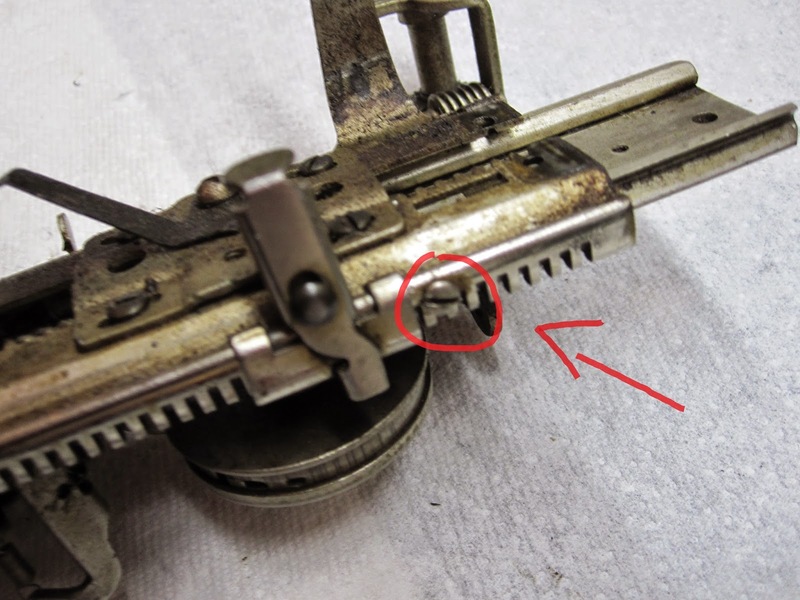 There are three screws specifically which hold the piece to the bottom of the rail. 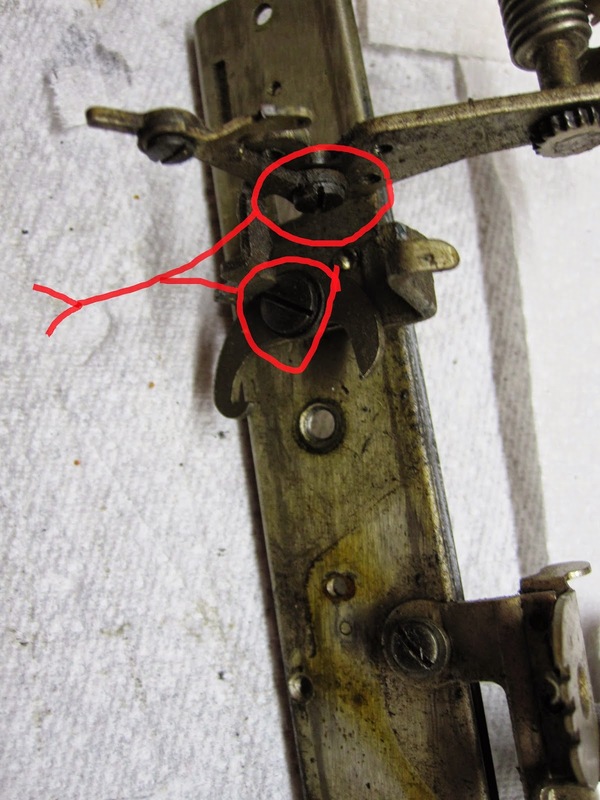 Before removing them, I take the bell off to more easily access them, and also unscrew the backspacer from the rail piece. Now we have the escapment/everything piece off the rail. After this, I take off the pieces used to rotate the spools, and also take off the spring catch. You are now at the last piece still screwed to the carraige rail, and quickly enough it should come off as well. Fox Sterling S12275, you shall type once more someday soon. This concludes day one of dis-assembly of a Fox Sterling. Stay tuned for day 2, on which I tackle to body of the machine. It should be noted that, save for the lack of folding arms, lack of carriage lock, and new hole on the sides of the carriage, a Sterling is 99% like a No. 2 in both carriage and machine body. Questions? Comments? Concerns? Feel free to respond below.